A shuttle bus service is also operational from April to November. The shuttle links the Blois SNCF train station and the ZooParc of Beauval. 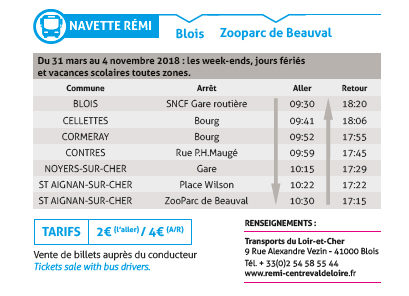 This shuttle service takes the schedules of the ‘Paris Austerlitz – Blois’ SNCF train line into account. It also stops at the towns of Cellettes, Cormeray and Contres. A 2 hour and 15-minute drive taking the A10, A71 and A85 motorways: Through Paris, Orléans then Vierzon, in the direction of Tours. Take the N°12 exit for St Aignan and follow the signs for the ZooParc of Beauval. A 1-hour drive taking the A85 motorway. A 45-minute drive taking the D675 road.